Rice University researchers have developed a new nano-infused ceramic that monitors its own health. The invention could pave the way for sensor-embedded structures like buildings, bridges and aircraft that last longer their current counterparts. Assistant professor Rouzbeh Shahsavari and his team modeled their new ceramic on a novel 2D compound called graphene-boron-nitride (GBN). Under elastic strain, the internal structure of a material stretched like a rubber band does not change. But the same material under plastic strain distorts its crystalline lattice. GBN, as it turns out, shows different electrical properties in each case, making it a worthy candidate as a structural sensor. Shahsavari had already determined that hexagonal-boron nitride – also known as white graphene – can improve the properties of ceramics. He and his colleagues have now discovered that adding graphene makes them even stronger and more versatile, along with their surprising electrical properties. According to the researchers, the magic lies in bonding carbon-based graphene and white graphene to each other in a variety of ways. Though graphene and white graphene naturally avoid water, when clumped, the combined nanosheets easily disperse in a slurry during the ceramic’s manufacture. The resulting ceramics, according to the researchers’ theoretical models, would become tunable semiconductors with enhanced elasticity, strength and ductility. “Fusing 2D materials like graphene and boron nitride in ceramics and cements enables new compositions and properties we can’t achieve with either graphene or boron nitride by themselves,” opines Shahsavari. The team used density functional theory calculations to model variations of the 2D compound mixed with tobermorite, a calcium silicate hydrate material commonly used as cement for concrete. 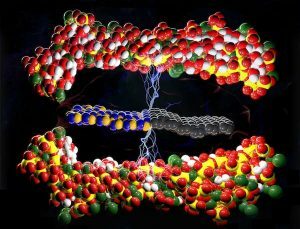 They determined the oxygen-boron bonds formed in the ceramic would turn it into a p-type semiconductor. Tobermorite by itself has a large band gap of about 4.5 electron volts. However, when mixed with GBN nanosheets of equal parts graphene and white graphene, that gap could shrink to 0.624 electron volts. The ceramic’s band gap dropped when strained in the elastic regime, making the material more conductive. But when stretched beyond elasticity – that is, in the plastic regime – it became less conductive. That switch, the researchers contend, makes it a promising material for self-sensing and structural health monitoring applications.